The Castleton experience is not about one, but about all the moments leading up to graduation. The internships and hands on opportunities available allow students to see all that their major has to offer, and in turn, choose the career path the best suits them. Alumni sport management major, Eric Horsfield, has explored the future possibilities of his degree through internships with the Spartan Race, the Quidditch World Cup in New York City, and working with the Sports Communication Department on campus. Originally from Tolland, CT. Castleton’s lasting first impression drew Horsfield into the Green Mountain lifestyle. In addition to the Vermont culture, he said the small campus made him comfortable knowing that to his professors he would be much more than a mere number on an ID card. “I loved the campus and the atmosphere that Castleton gives off,” Horsfield said. 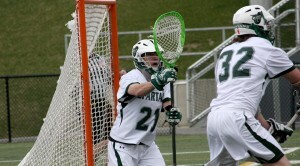 Outside the classroom, Horsfield has been a goalie on the men’s lacrosse team since 2011. In his 2012 season, he was selected to the NAC All-Conference First Team. In that same season, the Spartans won the conference championship on their home turf.